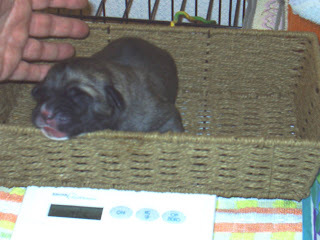 This is Asalet Aslan being weighed on Saturday evening. When born he weighed 770g and when weighed again last night he weighed 910g. He is growing and eating as puppies do and he has the making of an excellent dog and it will be great to watch his and the others progress over the weeks.